Recorded in many spellings as shown below, this is an English medieval surname. It is topographical for a person who lived at the top of the hill or on a piece of raised ground, originating from the Olde English pre 7th century word hiehthu, from "heah", meaning high. Topographical surnames were among the earliest created, since both natural and man made features in the landscape provided easily recognisable distinguishing names. The surname development since 1275 (see below) includes the following: Robert atte Heyte of Oxfordshire in 1279, Jana Hayght of Yorkshire in 1548, Elizabeth Haight of London in 1602, and Martin Hoyte who married Tripossa Witford at St Georges Chapel, Mayfair, on April 1st 1751. The modern surname spellings include Hate, Height, Hight, Hite, Hoyt, Hoyte, Hyght and others. 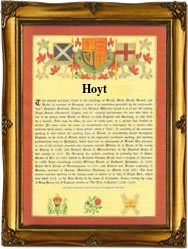 The first recorded spelling of the family name is shown to be that of Henry de la Heyt. This was dated 1275, in the Hundred Rolls of Derbyshire, during the reign of King Edward 1st of England, known as "The Hammer of the Scots", 1272 - 1307. Surnames became necessary when governments introduced personal taxation. In England this was sometimes known as the Poll Tax. Throughout the centuries, surnames in every country have continued to "develop" often leading to astonishing variants of the original spelling.